Choosing the ATS that makes sense for your recruiting team and their candidates is a decision that requires a little insider knowledge. This is an investment that needs the right features, functionality and support, in order to be effective. It’s no small decision, but – with the help of our clients - we’ve boiled it down to a small list! 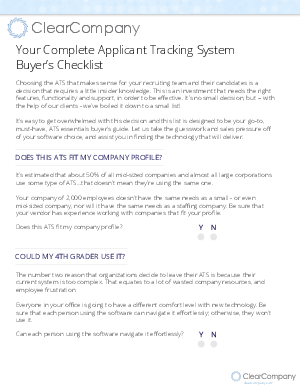 It’s easy to get overwhelmed with this decision and this list is designed to be your go-to, must-have, ATS essentials buyer’s guide. Let us take the guesswork and sales pressure off of your software choice, and assist you in finding the technology that will deliver.